Cook your lobster in this great pot! Great for that lobster, a bunch of crabs, corn on the cob, and other delicious dishes, this Bayou Classic 24-Quart Stainless Steel Stockpot Cookware Set is a terrific choice for any chef. Steam your favorite foods in this stock pot, but also let it double as a fryer by using the basket for other of your family's favorites. Make it a soup pot when you whip up big batches of soup or stew, and be a big hit with family and friends! 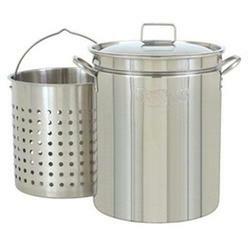 Stainless steel steamer pots and pans are a great addition to any kitchen cooking equipment arsenal. 24-qt size Accommodates large quantities of food, including lobsters, crabs, corn on the cob, and meats. Large basket holes Help water drain quicker when lifting seafood out of the cooking liquid. Nice deep pot Allows steaming, boiling, or frying larger quantities in home or commercial settings.